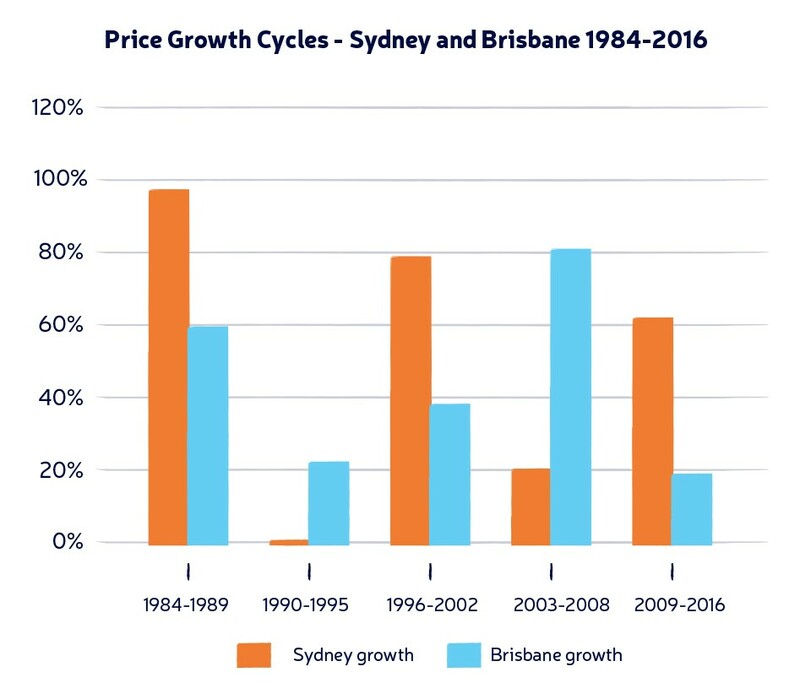 History tells us that Brisbane tends to lag Sydney in terms of property price growth, and in past cycles we have seen strong growth in Sydney spur an uplift in prices in Brisbane. These periods have also coincided with an increase in interstate migration. Sydney is currently 75% more expensive than Brisbane, a fifteen-year high that indicates we are likely to see Brisbane begin to close the gap between the two cities. Net interstate migration (NIM) to Brisbane is rising and in previous cycles an increase in NIM has resulted in a reduction of the gap between Brisbane and Sydney prices. Often described as ‘moving day’, there has already been a significant increase in the number of residents moving up to the sunshine state seeking more affordable housing and a better lifestyle. In the next ten years Brisbane is set to dominate the country in terms of population growth rates. Projections suggest that to 2027 Brisbane’s annual average population growth rate will be 2.2%. The next best performing city is set to be Melbourne, with 1.85%. 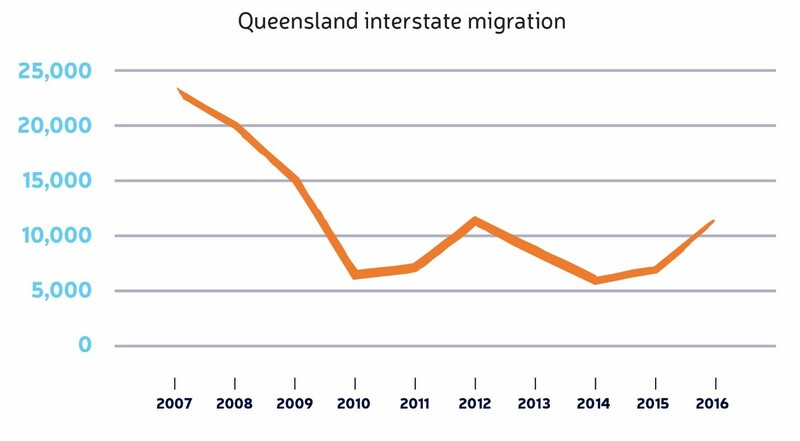 An increase in interstate migration has already occurred, with Queensland experiencing its highest growth in eight years. In the twelve months to May 2017, 15,716 Australian residents migrated to Queensland; a 173% rise on the figure recorded in the twelve months to June 2014. Brisbane’s affordability relative to its desirability is likely to be the key driver for sustained population growth. Traditionally, the primary contributors to the Brisbane economy were the manufacturing and resources industries. The evolution of Brisbane and its rise as a world city has seen an economic shift towards more knowledge-based industries, an evolution that will make the city less susceptible to risk and volatility. Employment conditions are also improving, with the unemployment rate dropping from 6.5% to 6.2% as of July 2017. For Brisbane’s inner-city apartment market, widespread transformation and infrastructural investment are key. Large-scale redevelopments are creating thousands of jobs and accelerating the evolution of the city. Projects such as ‘the Queen’s Wharf development, the Howard Smith Wharves redevelopment and the Brisbane Showgrounds redevelopment will add world-class facilities to the inner ring of Brisbane and draw demand from the young professional demographic. 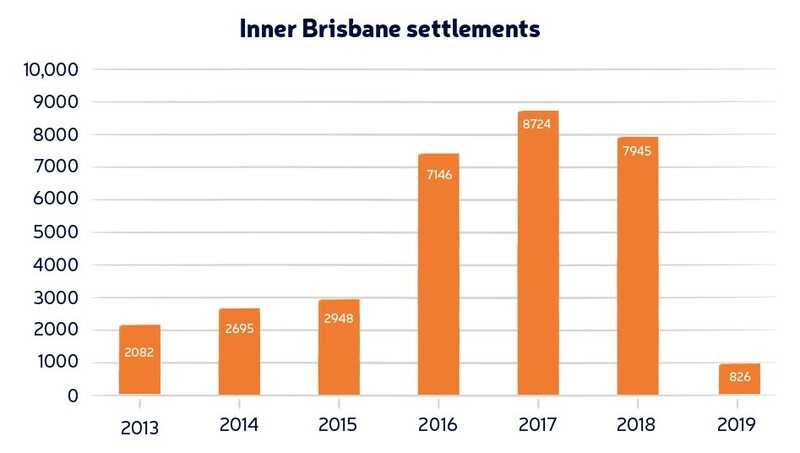 Between 2014 and 2016 Brisbane was subject to a supply increase in the residential property sector spurred by the historically low interest rate environment. Although causing short-term concerns, this is a standard part of a property cycle and the effects of increased supply were felt in many Australian cities. In late 2016 and throughout 2017 we saw a self-regulation of the market. Rising construction costs, restrictions on foreign investment and a tightened lending environment resulted in an increase in development cancellations and deferments, which grew from 5% to 35% during this period and resulted in a significant reduction of future supply. The Brisbane rental market reacted well to the increase in supply, with Urbis data suggesting that the vacancy rate for new dwellings is around 2.5%. From a cash flow perspective strong apartment rental yields (5%) and low interest rates ease the holding cost scenario, allowing investors to hold on to properties for the required timeframes. 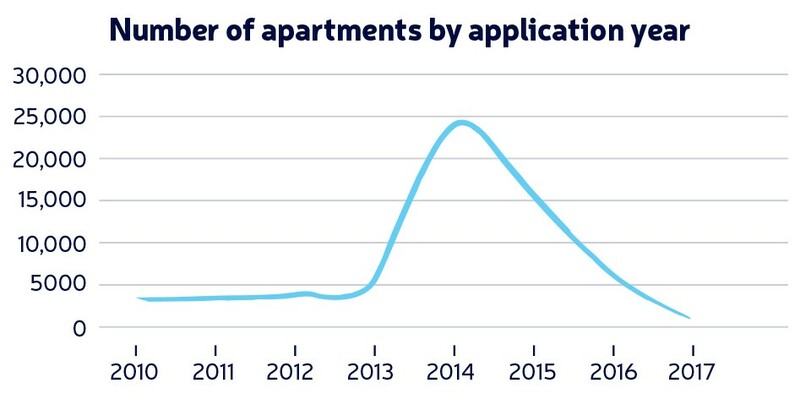 As the completion of several significant infrastructure projects near completion, the inner Brisbane apartment market is expected to improve. As the Sydney market begins cooling and the appeal of Brisbane increases we are likely to see further increases in interstate migration figures. Property price growth is a function of supply and demand. With demand on the rise and supply shrinking across the city, we are likely to see some upward pressure on pricing. In 2017 Urbis released data on development applications and settlements. Our focus on Brisbane will remain similar to that of 2017: projects in great locations with a stronger emphasis on their value proposition, point of difference and access to situational amenities. As Brisbane’s housing market continues to improve we will concentrate on the townhouse market in the middle ring. Our targets will be driven by the growing disparity between detached and attached housing markets as we attempt to identify the best value opportunities.